Yarls were the most wealthy and influential part of Scandinavian society. These were the chiefs of the tribe, the leaders of the Viking armies and the governors of King, who owned and ruled the vast territories. Earl usually had with him a small retinue of loyal soldiers willing to fight for it. When Earl decides to move in the Vikings, "that is" a journey in search of riches and fame, then to join his campaign, and many free men, drawn by the desire for profit and adventure. Rich Earl has an expensive, good make weapons and armor. Vendel helmet on his head, equipped with the protection of the nose with a half mask. The dome of the helmet is decorated with the crest of the ridge, having front and rear head kites. Superciliary arches are decorated in animal style. Crown and skeleton of the band also have a decorative engraving. All ornaments are made from bronze helmet with silvering and gilding. Such a hat as an additional protection could be fitted with metal shields cheeks, as well as chain mail aventail or steel plates to protect the neck. Luxury helmets Vendel era (ca. 550-800 years.) Predate the Viking Age (ca. 790-1110 gg. ), But could be part of the outfit of rich men - hersirs, earls, and of King. Other protective equipment consists of a chain mail shirt and a round shield, decorated with typical Scandinavian decor. The belt is suspended from a long knife-sax. Sheath Sax made of leather with a frame of gilded bronze. Sword was the most expensive and prestigious weapon. The best blades were imported from the Frankish state, and the handle were made in Scandinavia. The total length of the sword was about 90 cm sheath and guard decorated with copper, gold and silver, and the blades are covered with runes. Swords appropriated sounding names such as: "Golden Stick", "Diggers", "Vomiting chain mail", "long and sharp." The Sword in the Viking Age was considered as an animate object endowed with magical properties. 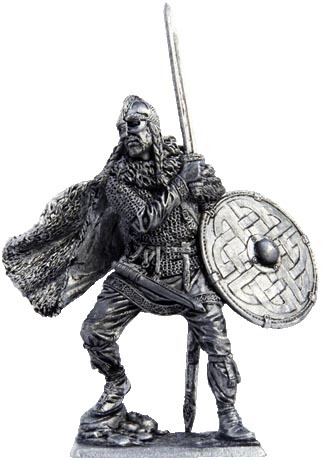 Speaking of swords, the soldiers used the colorful and poetic names: Odin Flame, Ice Battle, Snake Injuries, Dog Helmet, Battle Snake, Fire Shields, Horror chain mail, Language Nogent, Fire Sea Lord.